Health of a nation doesn’t only mean economic health; it also means physical and mental health of its people, especially the children who are the future citizens. Immunisation may well be the answer to economic well-being as it stems disability, morbidity and mortality. And vaccinations that are administered between birth and age of 6 years are especially the most critical ones. It’s almost a given that the more people are immunised, the higher will be the economic progress and prosperity of a nation, as a healthy population has better education and better cognitive power. This fosters productivity too. The focus on Ayushman Bharat, Routine Immunisation and Mission Indradhanush is testimony to the fact that the government appreciates the correlation. In fact, if you look at infant mortality, there’s data to show a decline in the number of infant deaths from 8.67 lakh in 2016 to 8.02 lakh in 2017, according to the United Nations Inter-agency Group for Child Mortality Estimation (UNIGME). Let’s scratch the surface to see what lies beneath. The data that 2018 Public Affairs Index (PAI), that prepares frameworks and arrives at gap analysis for governance issues, had mined on immunisation from NFHS, calculated the growth rates for the reference years 2005-06 and 2015-16. 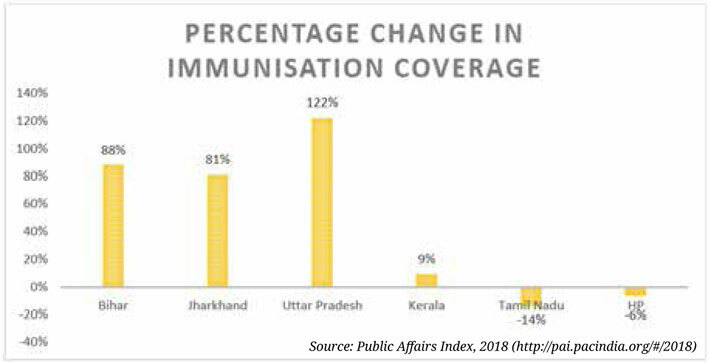 Interestingly, although Bihar and Jharkhand were at the bottom of governance ranking, the states had caught up with the ‘developed states’ in immunisation coverage by showing remarkable progress in the area. While Bihar showed an 88 percent jump in immunisation coverage between 2005-06 and 2015-16, Jharkhand showed an increase of 81 percent. In Tamil Nadu, the second-best governed state, it fell by about 14 percent! Kerala, the other state that topped the governance ranking chart, showed only 9 percent growth rate. Aim: To strengthen and re-energize the drive towards full immunization with all available vaccines for children up to two years of age and pregnant women. The government identified 201 high focus districts that have the highest number of partially immunized and unimmunized children. Full immunization coverage was used to grow by 1 percent a year. The rate increased to 6.7 percent per year through the first two phases of Mission. Four phases have been conducted till August 2017 and more than 2.53 crore children and 68 lakh pregnant women have been vaccinated. Immunisation coverage in Uttar Pradesh, ranked 15th on governance among the large states, soared 122 percent in the same period. In the small states’ category, the PAI analysis showed that Himachal Pradesh, the best governed small state, was losing its grip on immunisation. Despite being the laggards in governance, both Jharkhand and Bihar – states with high population levels – are close to the national average of 62 percent in immunisation, as reported in 2015-16. What if the immunisation data for some states are mapped to the spending on education and health? A look at total budget expenditure for education and health as a percentage of GSDP in these states throw up interesting insights. In Bihar, where immunisation coverage had expanded substantially, the budget expenditure on both education and health as a percentage of GSDP also shows an increase around the same time, rising at least in double digits. Aim: To further intensify the immunization programme, to reach each and every child up to two years of age and all those pregnant women who have been left uncovered under the routine immunisation programme (UIP). Under UIP, the government provides vaccination free of cost against vaccine-preventable diseases including diphtheria, pertussis, tetanus, polio, measles, severe form of childhood tuberculosis, hepatitis B, meningitis and pneumonia (Hemophilus influenza type B infections), Japanese encephalitis (JE) in JE endemic districts with introduction of newer vaccines such as rotavirus vaccine, IPV, adult JE vaccine, pneumococcal conjugate vaccine (PCV) and measles-rubella (MR) vaccine in UIP/national immunization programme. According to the latest data of 2014-15, Tamil Nadu and Kerala’s total expenditure on education was about 2 percent and 2.55 percent of GSDP, respectively. In Bihar and Jharkhand those were higher at 6.4 percent and 2.64 percent, respectively. Both in Kerala and TN, the expenditure on education as a percentage of GSDP, had declined between 2005-06 and 2014-15. The total expenditure on health as a percentage of GSDP was 0.73 percent and 0.97 percent in TN and Kerala, respectively, in comparison to the 1.45 percent and 1.14 percent in Bihar and Jharkhand, respectively. In Jharkhand, in fact, the spending on health had increased by about 50 percent over the decade. The better governed states were seemingly spending less on education and health, maybe thereby impacting immunisation coverage levels. Immunisation drives, too, need a shot in the arm in order for the coverage to get wider and all encompassing. 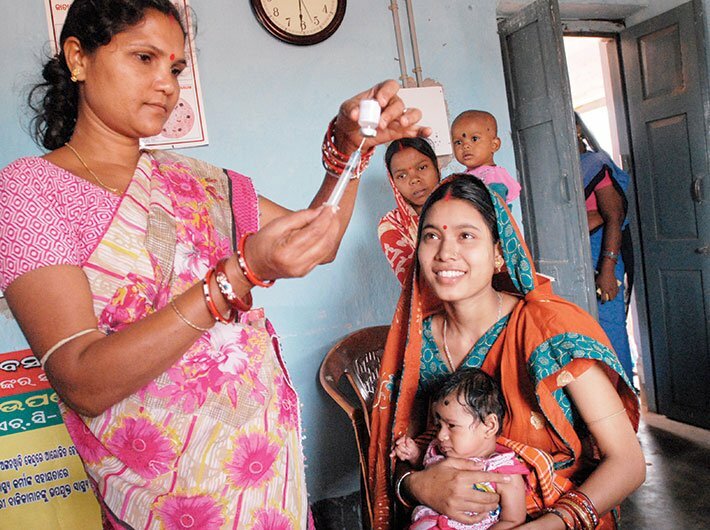 The data from the health ministry for 2014-15 shows less than 1 percent of the total current health expenditure of Rs 4.5 lakh crore has been spent on immunisation programmes. Trust between health services and communities is the key in immunisation. The deeper the trust, the easier it is to engage the community. Make women the harbingers of change. Health-literate and knowledge of incentive-based schemes can not only empower women but also make them change agents, thereby looping in more children. A two-way communication can give immunisation a real shot in the arm – there should be an opportunity for the community to freely voice their concerns and doubts, and also ask questions. Mukhopadhyay is consultant with Public Affairs Centre, a not-for-profit think tank committed to good governance. Data mining support by Udita Dutta, programme officer, PAC.